We take basic banking facilities for granted back in the UK. If you want to open a bank account, you pop in to your local branch, fill out a form, prove your identity and it’s good to go. Want to draw out cash? We’ve got ATMs all over the country, and most of them are free. This changes when you move abroad. Accessing money becomes a logistical issue. There are new costs involved. Will you keep your bank account in the UK and draw out money whilst overseas? Will you need a local bank account to receive a salary from your foreign employer? Will you store money in GBP, EUR, USD… or some other currency? These are questions we don’t consider until we actually need to think about them. 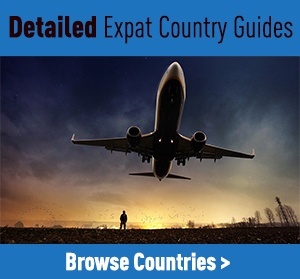 In this guide to expat banking for Brits, we will show you some of the best options for banking overseas; and for transferring money between accounts. Option 1 is restrictive in that your bank will send all correspondence to a residence in the UK. You’ll have to be in the UK to deal with management of the account. Option 2 is fine if your income is derived overseas (but not so great if your income is earned in the UK). Option 3 involves opening an account in a foreign jurisdiction with ‘looser’ tax regulation, such as Jersey or the Isle of Man — but it is expensive, has plenty of caveats (minimum income), and is not for your average expat. Option 4, an expat account with a UK bank, provides the best of both worlds: convenience, worldwide support and the ability to save and pay in different currencies. HSBC is a worldwide bank with a heavy international presence. Their Expat Current Account allows you to save in three separate currencies, with a visa debit card in either Sterling or US Dollars. The HSBC Premier service (included with the Expat account) gives customers priority access to a number of branches outside the UK. You can check coverage in your destination country by using their Premier branch locator. While the Expat Current Account is a good option for existing customers, it is expensive for those who don’t currently bank with HSBC. You’ll need to allocate £60,000 to assets/savings held with HSBC, along with the initial £5,000 deposit. Minimum opening balance: £5,000, $10,000, €10,000. Requirement: New customers must have £60,000 already saved/invested with HSBC. Standard Bank’s Optimum Account provides an international bank account in one of four currencies. This account is targeted at ordinary expats who don’t have a large chunk sum to open an account with. You can avoid monthly charges by depositing £4,000 (or the equivalent amount in USD/EUR/AUD) and then maintaining this minimum balance each quarter. Lloyds offers international bank accounts domiciled in either the Isle of Man or Gibraltar. This account has fee-free international payments and transfers from overseas. You can get a visa debit card in one (or all) of the supported currencies. Extra charges may apply for extra cards. The monthly account fee at the time of writing (July 2016) was £7.50 (or €8 or $10). Exception: *You may not need the minimum opening balance if you have a gross annual income of £50,000. Check their website for eligibility. Please note that we are not affiliated to any of the banks listed on this page. We do not receive any payments for sponsorship or advertising these services. The information is provided for free. We cannot guarantee that it is accurate. Terms, conditions and requirements may change. While we attempt to keep the information up-to-date, please visit the respective websites of each bank for their full terms and conditions. If you are leaving the UK permanently, you may wish to consider changing your country of domicile and moving your banking overseas. There are some good reasons for a British expat to open a local bank account. You can start to build a credit profile — If you plan to borrow money whilst abroad, e.g. for a foreign mortgage, you will benefit from having a local bank account and some history holding money in the country. Employers may only pay local bank accounts — Depending on where you are based, many employers simply won’t be able to pay you unless you have a local bank account. Keeping money out of the UK simplifies tax affairs — If you’re not in the UK, and don’t plan to be, you can save yourself any ‘Double Taxation’ issues by simply not bringing money in to UK institutions. It’s easier to get support — Say what you want about the best international bank accounts, customer service is still a lot more convenient when you can walk in to a local branch and deal with the bank in person. What are the disadvantages to opening a local bank account abroad if you’re a British expat? Language/communication barriers in some regions — English is well spoken in Europe and North America, but if you’re heading off the beaten track, you may start to miss the ease of communicating in plain English. Potentially fewer options for foreign customers — British banks are International powerhouses. We’ve grown up in one of the most advanced banking nations on Earth. Other countries are still playing catch-up. Many of the services you take for granted with your British bank may not be available with a local bank account overseas. In some countries, there may be restrictions that apply to foreign account holders. Unfortunately, it is not practical for us to cover the many thousands of local bank accounts available outside the UK. A simple Google search in your destination country will uncover some of the best options. Transferring money from a bank in Britain to a bank overseas, or vice versa, has traditionally been a costly business. Many banks charge fees for international transfers, then there’s the exchange rate to navigate. We’ve learnt to associate transferring money with losing an indecently sized chunk of it. Thankfully, there are signs of change ahead. Financial technology, the so-called ‘FinTech’ revolution, has ushered in a wave of companies that specialise in making money transfers cheaper than ever before. This is great news for expats who need to move money between foreign accounts. Currency Fair — Another FinTech disrupter, CurrencyFair offers to save up to 90% on international transfer fees using a peer-to-peer marketplace. Currencies supported as of July 2016: AED, AUD, CAD, CHF, CZK, DKK, EUR, GBP, HKD, HUF, NOK, NZD, PLN, SEK, USD and ZAR. WeSwap — WeSwap is a peer-to-peer marketplace that connects travellers to other travellers. Members receive a WeSwap card (MasterCard®) which they can load money on to online. They can then ‘swap’ money in to one of 18 different currencies on the same card, which will automatically know which one to use. As these companies gain traction and tap in to ‘Uber-style’ network effects, we can expect the cost of sending money overseas to become cheaper and cheaper. Great news for expats and all Brits abroad! Please note: The content on this page is designed for general informational purposes only. We are not explicitly recommending any of the services or bank accounts featured above. We do not receive any commission or payment for writing about them.